A new solution by trakMD that could potentially save lives! Blood is the most precious gift anyone can give to another person. You don’t need a special reason but just your own reason to give blood, give life. Every minute, someone in Lebanon needs blood. Blood cannot be manufactured or stored for long time, and there is a constant need for people to give blood. All people should engage in saving the lives of a baby, an adult, a woman in labor, a patient combating cancer, survivors of car accidents, terrorist attacks, or war. One day, you or beloved ones might need a blood that could save yours and your beloved ones’ lives. To facilitate this humanitarian cause, trakMD has recently released a blood module, available with trakMD App on android store, that puts the power to save lives in the palm of your hand. 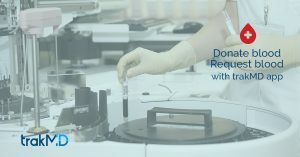 It allows hospitals and people in urgent need of specific blood types and volumes to put out requests for blood, and all trakMD users will be aware of the requests via push notifications. trakMD users, in particular, potential volunteers can look up details of all blood requests and respond by calling the affected patient or family and visit the blood bank to donate blood. It is unfortunate that sometimes people might need to call everyone they know and ask them to call those they know might share the same blood type as the patient and are willing to volunteer. trakMD helps those in need reach out to as many potential volunteers as possible, and thus aims to be the main hub for this humanitarian cause. trakMD has made finding and booking doctors and dentists in Lebanon much easier than before. With easy access to the right care, integrated health reminders, and personal health record, a better health begins here.